I had originally thought about sharing my reflections on Great Lent on my blog. There is much to share. From Forgiveness Vespers through Great and Holy Saturday there is so much happening both in the Church and in our own lives that it would have been easy to have blogged almost daily. Alas, I did not do it. Initially, I just did not have the time. As I thought about catching up, though, I decided to not blog during Great Lent. Perhaps I will share some of this in the future. For now, Holy Pascha approaches, and we eagerly await celebrating the Resurrection of the Lord. There is a movement happening throughout our country today that affects many facets of life…postmodernism. There are several things that make up this approach to life, but I am only going to focus on one…the loss of an absolute truth, in essence, the loss of reality. As I continue to study history, and the study of the study of history, this is a topic we have only begun to talk about…the postmodern approach to the study of history. Basically, in this approach, one says the past really cannot be known, therefore no one’s opinion can really be right, therefore all opinions are equally valid interpretations of past events. The problem with this is that real things actually did happen. While it is true that two different people can look at the same evidence and come to different conclusions, they are still looking at evidence and trying to base their interpretation on actual events. These things really did take place – there were real reasons why so-n-so did such-n-such, and it is possible to discover some of this. From the postmodern perspective, though, this reality is lost in a world of opinion – one wherein each opinion is an equally valid idea, no matter if there is any real support for it or not. Each view then become just another view, and they all have the same merit. As a student of history, I find this terribly frightening in the field of history. As a Christian, I find it horrifying in theology and the church. This postmodern approach, which in reality (whether it intends to or not) denies there is a truth, and the denial of Truth is the denial of Christ Himself, who is the Truth. This has come up several times is different ways…an elder at the church I pastored would tell people (in this strongly sola scriptura church of “just me, my Bible, and the Holy Spirit”) that if you accept one person’s opinion or writing outside of Holy Scripture, then you must accept all person’s opinions and writings. Aside from being a logic fallacy, the idea fell over in many other ways. First off, and this is something we have to come to terms with, all opinions are not equally valid. Perhaps this is the Enlightenment ideals still pushing the equality of all in our culture – now to the point that everybody’s ideas are equally valid. If so, I understand why some hold to it so vehemently. But I will tell you plainly, if you have a serious medical condition, seek a doctor’s advice before you seek mine. Don’t go see a butcher for a surgery, just because he thinks he knows how to use a knife. You probably do not want to go to dentist to fix your car, just because he uses a plier type tool to pull teeth with. Common sense shows that all ideas and opinions are not equal. We can use some level discernment to know that the M.D.’s opinion is probably better than the CNA’s on a severe medical condition. Yet people who insist on some level of logic and reason in other areas of there life can completely miss it in other areas. I was recently asked to read a book, which purported to contain “church history” in it. The author basically wrote that everybody, from apostolic times until now, has it all wrong. Now he has come to show “the truth.” To help support his argument, he tries to use “history.” (in this case I use that term lightly). The history, according to him, uses no primary documents, and his secondary sources are contemporaries who are in the same movement as himself. It is a heavily ‘footnoted’ (again, using the term lightly) book, but none of the footnotes offer any real evidence or support. They are just dressing. From a historical perspective, it is a simple case of “bad history.” He does not offer a single bit of evidence to support his conclusions, and he outright ignores a plethora of evidence to the contrary. So what? I read the book, recognized it’s obvious shortcomings, and dismissed it. So why mention it now, and what does this have to do with postmodernism? Others will read that book, even knowing that there is no evidence to support what the author is saying – and in fact there is evidence to the contrary, and they will still accept it as a valid and possible interpretation (along with it’s presented application). Enter postmodern thinking. Two people can say two opposite things, but they are both “valid opinions.” We decide things, not based on if it has any support, but if it can make sense to me. We are being taught more and more to consider all ideas equally valid in our heavily pluralistic Western society, so much so that to say the opposite now sounds like someone is being intolerant. As strange as I find it in history, I am truly frightened by it in theology. More and more people say that while Christ may have come and delivered some sort of truth or faith, that it must have been lost and really is unknowable…it is hidden, so every idea about is valid. There are over 30,000 different Protestant denominations, and people will argue they are one church. They hold not only inconsistent ideas about salvation and Jesus and God, they are often contradictory and mutually exclusive ideas about what salvation is, who Jesus Christ is (He cannot be pre-existent and not pre-existent, truly God and not God at all, truly man and not really a man), and God (modalism, Trinitarianism, and adoptionism are mutually exclusive ideas). These are basic tenets of the Faith. How we perceive these things define our Faith – even who are Faith is in. If I worship the Holy Trinity, and you deny the Holy Trinity, how can one then say we worship the same God? If you deny my God, and I worship something you see as false, how is it the same? Because we live in an increasingly more postmodern and pluralistic society. The sad thing is that when we make everything true, nothing is true. All opinions are not equal and valid. When we try to make them so, the only way to do so is to make them all equally bad. Then we get to look at them all, and tailor make a faith for ourselves, in our own image, with the things we want, and we can even “interpret” reality to make it fit into our thoughts. We can then align ourselves with people who hold the exact opposite beliefs and say we all believe the same thing. That gives me a headache just writing it. 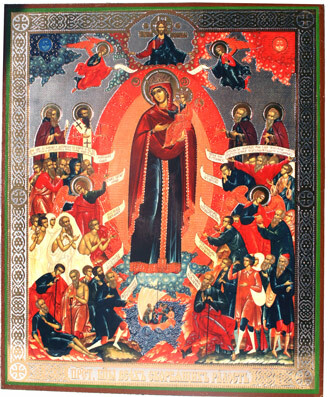 There is real Truth, but that Truth is not found in opinions – or in the denial of reality or the denial of truth – it is found in the unchanging and consistent message of the Holy Faith, in the lives of the martyrs (Orthodoxy has been rightly called the “Church of the Martyrs”) and the Saints, in the Liturgies and prayers of the Church, and in the pinnacle of this Holy Tradition – Holy Scripture itself. It is not our role to try to force the truth into our mold, nor is it to deny the truth by declaring everything equally true…we must seek out and find that which is true, the very Truth Himself. My wife wanted to leave. About halfway through the service she was done. I, of course, had been excited all week about the episcopal visit of our Bishop, Sayidna Joseph. But halfway through the service Tori was ready to go. This all happened last Spring (2008). As I have shared our journey throughout this blog, I have gone back and forth – talking about many of our first experiences and what they were like, and what made differences to us in our family’s journey to Christ’s Holy Church. This was the first time we met His Grace, Sayidna JOSEPH. At the time, Tori was coming to some services here and there, at my request. I was still pastoring at the Protestant church I was at. While Tori was more than ready to be done there, she still had not yet come to Orthodoxy. I had asked her to come with me to meet Bishop JOSEPH, and she had agreed, but she was not quite ready for what she found. First, one has to say that there is pomp and circumstance in Orthodoxy. Of course, one sees this in Holy Scipture…just a cursory reading of the heavenly liturgy in the book of Revelations shows plenty. It is funny, very early in this journey, around the time that Tori realized I was moving down this road, she asked if she was still going to be able to have a big beautiful wedding for Elisabeth (worried that, I dunno, there would be some wierd, bland service). I called our good friend Matthew, a convert to Orthodoxy from Roman Catholicism, and asked him if Orthodox have big beautiful weddings (we hadn’t seen “My Big Fat Greek Wedding” yet). His reply, “We’re Orthodox, we do everything with pomp and circumstance” (my paraphrase). So of course, receiving his Grace was a big deal…as it should be. I told Tori that I wanted to meet him, and I had wanted to bring the camera in so we could get a picture. She was opposed to me bringing the camera in. “He was not a movie star,” she said. About halfway through the service, it was a Vespers, while His Grace stood on a rug, with his staff in his hand, and did some part of the service, Tori commented: “He has his own rug!” She was ready to go. It all seemed too much for her. She curtly informed me that she was not going up to meet him – I could if I wanted to but she was not. Well, it did not end there. Fr. Mark, our parish priest and a man with a giant heart, came up afterwards and said “Shawn, Tori, come meet His Grace.” And Fr. Mark says it in such a loving and humble way that one cannot say no…at least Tori could not say no. She submitted and went up with me and our kids to meet Sayidna JOSPEH. Fr. Mark introduced me “as close as you can get to being a catechumen without actually being one” and I made the bow and asked for his blessing. I was really looking forward to having just a few minutes with him. Then he spoke, and with a depth of love and humility in his eyes he talked…to Tori. He spoke for about five minutes to Tori, and a little to Elisabeth. I stood to the side and listened. He did not say anything pushy, he just talked about taking one’s time in the journey to Christ’s Church and a few other things. I couldn’t even quote something he said. But that wasn’t it. It was the depth of love in the man…the reality of Christ in him…the compassion and humility in his eyes while he spoke. It was this love and grace that flowed out of him, and the gentle humility while he shared. There is a character to every priest that we have met so far, some of this same quality, this same love and humility…Tori always comments about seeing something in their eyes…she is far wiser than I am. She left that meeting loving our Bishop. Those few minutes touched her in a profound way and were an intrical part towards her steps to the Holy Faith. The little things that she let bother her during the service dissolved in the Truth of the life and this Faith. In recounting this story to someone later, I made the comment about Tori having been uncomfortable with the rug and the staff, and the comment was made “Well that doesn’t sound very humble.” To which Tori stood up in defense and said “Bishop Joseph is very humble.” At the time, when she was still unsure if she was going to follow us, I was totally shocked to hear her stand up in defense of the Faith. You know, it is interesting. We live in such a technical and information based world, that when people approach the Faith they think they can do so via the internet. I was guilty of this a little, focusing more on the books than on the life. There are several people that I have visited with about Orthodoxy, and many only want information…what is this doctrine or what is that. They want to know about it, but it ends there. One cannot know Orthodoxy from the internet, or from reading a book, or from reading a blog. There are some great books out there, but none of them hold a candle to meeting the Church herself. Without actually coming to the Church, seeing the life, the services, worship focused on God not man, the sacramental way we live, the love and compassion in the eyes of her priests, the true koinonia (with all of its struggles) that is there, Christ Himself present with the Holy Angels and the Saints…words can never describe it, without meeting the Church and getting to know her a little, one does know her…how can they. I have some great books on Theodore Roosevelt, but I don’t know the man. I find it interesting how people just want information, and that is it. From there they make their judgments. I had someone tell me once that they knew the Orthodox Church was not the Church of the Apostles…they had never set foot in the door, had never seen a service, didn’t know anything more about the Faith than the drop I had told them about. What was there basis for this? Who knows. Tori could probably tell you very little “information.” My friend Matthew and I like to talk theology, and we speak of kataphatic and apophatic, and both of our wives hate it…if I recall, Matthew’s wife Natalia wanted to blow our words up. What I have learned, though, and something that never would have made sense to me when I was a Protestant, is that my wife is way more spiritual than I am. What draws her to Orthodoxy is the simple Truth of it, despite the struggle that Truth brings with it. That was not gained or learned in books…it was found in the life of the Church, in experiences, too many to count, like this experience where we were able to spend just a few minutes with His Grace, Sayidna JOSEPH. I sit here this evening before I go to bed, knowing that in the morning heaven and earth will meet in the Divine Liturgy – and my family and I will be attending as catechumens in Christ’s Holy Church. It is still an amazing thought to me, and how all of this has come along has been even more astounding. Tomorrow, after services and the coffee hour, our priest and many others will go to do the last couple house blessings, we will come home. Tomorrow night we begin our catechesis with a few others, and we our hosting the classes in our home, so we are going to take some time to finish getting the house picked up and ready. Over the last few weeks I have been amazed at the change and the difference in my wife. For those who have followed the blog, Tori was opposed to Orthodox Christianity and was not happy I started to go. Eventually, it was the kids and I, and she was rather resistant. But over the last year, the love and humility of our priest, the wisdom and compassion she saw in others, and the power of the True Faith itself began to chip away at her objection. It was still slow going, and we waited, but earlier this month she decided she wanted to become a catechumen, and our family was received. It is exciting for me to see this growing faith in my wife, especially since 18 months ago she was done with Christianity altogether. But here, in Christ’s Holy Church, she has found a hospital for the soul…true spiritual help and healing…all of the things we looked for but never found in their fullness in previous church experiences. We have come home to the Holy Faith of the Apostles. Glory be to God! From the Spiritual Psalter, from the holy works of St. Ephraim the Syrian, excerpted by St. Theophan the Recluse. Frightening and terrible is the day of Thy judgement, O our Savior, when secret sins will be revealed. Therefore I tremble, O Lord, and am embraced by terror, for my sins have exceeded all bounds. Be merciful to me according to Thy compassion, O good and kindhearted One! I look, O Lord, at my sins and become agitated, seeing their multitude. Alas, how did it happen that such misery has befallen me? My tongue utters marvelous things, but my behavior is shameful and contemptible. Woe is me in that day when secrets will be revealed! Others find my words immensely beautiful, but my deeds are repulsive. I teach others in the world how to order their lives; but I, who am an unfortunate one, myself indulge in the passions. All my days have passed and vanished in sin. I have not served truth for even one day. As soon as I began to repent with the intent to sin no more, the evil one always came and trapped me through his hatred. Woe is me, for voluntarily do I land in his snare. As soon as I vow to repent, I return again and fall into the very same sins. The time I spend in sin gladdens me; I even think that I am doing something praiseworthy. Woe is me! Until now I never considered that gehenna awaits me. An evil will leads me into sin, and wen I sin I lay blame on Satan. But woe is me, for I bring about my sins myself. The Evil One does not use force to make me sin; I sin according to mine own will. Be kind to me, O Thou Who art kindhearted to the penitent! Forgive me my transgressions according to the magnitude of Thy goodness. Accept, O Lord, the tears I bring to Thee, and cleanse me from sin, as Thou didst cleanse the harlot. I realize, O Lord, that I have sinned. Spare me according to Thy compassion. Through the prayers of our holy fathers, O Lord Jesus Christ our God, have mercy on us and save us. Amen. One of my struggles as a pastor, and in my own Christian walk, was that of community. Many people I talked to shared some of the same struggles – where was the sense of community that they recognized from the pages of the New Testament. We went through, in our Men’s Ministry, the DVD series by John Eldredge, Wild at Heart: A Band of Brothers. This video series highlighted the need for men and women to live in community, and, in a sense, to struggle and strive together. I took three different groups through this series, and none of them formed a band of brothers. Earlier in my ministry, we did “Prayer Accountability Partners.” Few showed up for it, and after a year only my partner and I met (something we did until he passed away a year and a half ago). Many of the problems in the church we faced were problems with the lack of community. Some people did not feel like they belonged…some in truth were not welcome…some felt they belonged but it was more a sense of entitlement (this is my church) than it was a sense of community and belonging to one another. Others probably felt a sense of community, but based on my experience and pastoral counseling, it was not many. Many recognized the need for community…hopefully more than just a social club…but the fruit was just not growing on the tree. In our journey eastward, we found something else, we began to see and realize koinonia in a way that we had not experienced before. I began to see that all of these things we had been trying to force, through programs, minsitries, small groups, etc. came naturally in the Eastern Christian life. After two and a half years, we have taken the step foward and been received in the Ancient Christian Faith as catechumens. Glory be to God! Waiting in the Narthex to be received between Matins and the Divine Liturgy. Fr. Mark saying the prayers as we are received into the Church as catechumens. During the Divine Liturgy, during the prayer for the catechumens. Two and a half years ago, as a Protestant pastor, I first stepped into an Eastern Orthodox Church. That moment was a defining moment for me, for while I did not know exactly what it was, I knew there was something there…something I had been looking for. In retrospect now, I see that much more clearly. All of the various stages of my journey, the different steps I took, the lessons I learned, all of it led to this place. The more I came to the historic Christian Church, the more I visited the Apostolic Faith, the more I knew. Questions abounded, but with time the questions became less important. They were answered or consumed by the magnaminoty of the Faith. Somewhere along that journey, I knew, not just in my mind but in my very being, that I was home…that if this was not it, if it was not the Apostolic Faith, then there was none…there was no where to go from here. Come what may, I was finally home…finally to the place I had longed for since I was a young boy reading the Gospels late at night in my bed. Praise be to God for that. My wife, Tori, on the other hand, wanted no part of it. She had not grown up in a Christian home, and everything in her Christian jounrey had been pushed upon her. Here she was, a pastor’s wife… She was done with church altogether. Some bad experiences at our previous church left her wanting nothing to do with church. And the only place she did not want to be more than at the church we pastored was the Orthodox church. Slowly, though, she met the people. She saw things in the kids. She eventually began to come to church…once in a while. I was finishing my last few months as pastor of the Protestant church I was at, and I had all sorts of schedules and ideas in my mind. I was leaving the pastorate and that church in June, and I wanted to become a catechumen in July. We, the kids and I, contemplated becoming catechumens without her. My kids were anxious, as was I, to take the next step. Fr. Mark, hieromonk, one of my dear spiritual fathers in Twin Falls, had a different perspective. He said to wait for my wife…to drop all my schedules and plans, and to take this as an opportunity to crucify my self-will. He told me this was an opportunity to love my wife, to show patience, and to put her before me. My schedules, my plans had to leave. Hard, but necessary. As usual, he spoke the truth. Fr. Mark, our priest and a man who has had a profound impact on Tori with the love and humility that is so apparent in him, came to talk to Brendan. Wait for your family, he said. After talking with him, Brendan, too, began to practice patience. In August, Fr. Patrick, another of my spiritual fathers and guides in this journey…the man who first introduced me to this ancient and beautiful faith…affirmed that it was good that we wait. He told me he saw Tori’s caution and her taking time and moving slowly as representative of the time that we all needed…that we would be ready when she was ready. Again, hard…I saw myself as being ready before I even left the pastorate. And again, he spoke truth. On Christmas Eve, Tori told me she was ready to start attending the Divine Liturgy on Sunday morning regularly. Last week was our first Divine Liturgy as a family in this part of our journey…where Tori was going (as I mentioned in a previous post, she had attended services sporadically before, but then she always came because I wanted her to more than on her own – this was her decision, her own). At church that day, she said she was ready. For what, I asked. She was ready. We spoke to our priest, Fr. Mark, and asked his blessing for our family to become catechumens, which he graciously gave. This Sunday, before the Divine Liturgy, Lord willing, my family and I will take our next step in the Holy Church…we will enter the catechumenate. During my pastorate over the last eight years, Christmas was a fairly de-emphasized event in our home. As I believe I have mentioned before, I grew up in the Methodist Church, and for us, Christmas was a really big deal. I still think back with fond memories of the Christmas programs we put on and Christmas caroling we did. Some of my favorite songs were Christmas songs (and still are – I love “Gloria in Excelsis Deo” and “O Holy Night”). When I was challenged in my Methodist thinking by someone I knew about some doctrines, that began a journey for me – one that would eventually lead to Orthodoxy – but first would take a detour through the Seventh Day Sabbath churches I was part of for the last fifteen or so years. While I have now left many of the peculiar teachings of those groups, they did instill in me a desire for the Truth and to really know and be part of the first century Church. In that tradition, I learned to question things and it was there that I really set out in my quest for the Truth. It is that quest that has now been fulfilled in the Ancient Christian Orthodox Faith. It is that journey that brought me home. For that I am thankful. One of the things, though, that was part of these Seventh Day Sabbath church traditions that I was part of was the idea that Christmas was a pagan holiday and should not be celebrated by Christians. This was also true for Easter. Some of this was really just poor scholarship, some of it was not understanding the power of God, but then again, I am not hear to make theological points about these holidays – I am just trying to share some of my experience and struggle. So, during that part of my journey, I, at least intellectually, left Christmas. This was an important holiday for my mom and my grandparents, and was a very big deal for us as a family, so I still went and attended. In my mind, though, I was going out of respect for my family, not to celebrate Christmas. When I married, my wife was pushed into this idea that Christmas was somehow bad – an idea she never would accept and would cause a little tension in our relationship. We still went to my mom’s for Christmas, but I always tried to make it clear to my wife and kids we were only doing this out of respect for my mom. Now I am going to digress a little, and in doing so I am going to change my mind and introduce a little bit of theology. After all, it’s my blog – I can change my mind if I want, can’t I? Christmas is intrinsically linked to the Incarnation. God became man. Christ is fully God and fully man. This is one of the central teachings of the Christian Faith – Christ came in the flesh. We recognize that throughout the year, but Christmas – or the Nativity of Christ – His birth, is a profound celebration of this event. In the Nativity, there is so much of what the Church practices and believes. Much of the theology of Mary is found in the Nativity narratives, especially in Luke. But even more so, we see in the Nativity the virgin birth – we see Christ, the Son of God and the Son of Mary. This truth – Christ as fully God and fully man – is seen no where else more clearly than in the Nativity. This truth is paramount to our proper understanding of who Christ is and what He accomplished for us in the totality of His life and ministry – beginning with the Incarnation and culminating with the Resurrection and Ascension. In losing sight of the Nativity, it is easy to lose sight of much of the Christian Truth. This always presented a struggle for me, because deep down something stirred in me for the Christian Christmas. Sadly, the world’s view of Christmas made it easier for me to reject. The world’s Christmas is a secular holiday and much more a celebration of capitalism and the American dream than it is about Christ. Where does Christ fit in to a crazy mob trampling and killing a store employee so they can get the best deals on Christmas presents. Lord have mercy. As I journeyed into Orthodoxy, though, I began to see how the Church sees Christmas – and why it is such an important celebration. Not too accumulate more stuff, but because of the great mysteries and work of God that took place in the Nativity. This was one of the great feasts of the Church – Fr. Thomas Hopko has referred to it as the “Winter Pascha.” And, in the Ancient Christian Faith, times of feasting and celebration are preceded by times of fasting. Last year was one of the first years I really fully embraced Christmas in many years. By then, all of my objections and concerns had been dissolved. The reasoning I carried from the more anti-Christmas tradition I had been part of had been explained and nullified. My questions and concerns had been answered – and in the answers I found a far greater Truth and much greater God than I ever imagined. Praise be to God. So last year I set out to celebrate Christmas. In Orthodoxy, we celebrate Christmas once Christmas arrives. The “twelve days of Christmas” are the twelve days spanning Christmas and Epiphany on the sixth of January, celebrating the baptism of our Lord. Those twelve days are fast-free, and are very joyful. The world celebrates before Christmas, and once Christ arrives, they pack up their things and go home – the celebration having ceased. December 26th, and it’s all over, and for many it is time to start worrying about how they are going to pay their credit card debt. In Orthodoxy, from mid November until Christmas is a time of fasting, a time of preparation. Then, when Christ arrives – it is then that the celebration really begins. We celebrate for those whole twelve days. Last year, it was this time of preparation that really hung me up, though. During that fasting period, I really did not want to do anything “joyful” regarding Christmas, because that was for “after.” I did not want to decorate a tree until really close to Christmas, and I reluctantly put some lights up on our house. “Let’s not be celebrative at all – this is a time of fasting” I thought. I kind of felt that I really should not have anything Christmas-y until Christmas day, then we would have our celebration. Again, that left a struggle for me last year. I did not understand some of the more celebratory things that the Church did, or some of the wording in the liturgical services of the Church. In November of this year, though, as I was beginning the Nativity Fast, I was blessed to listen to a podcast by Fr. Thomas Hopko, on of my favorite people to listen to, about the Nativity Fast. This is available to listen to from Ancient Faith Radio. One of the things Fr. Tom brought up that really helped clarify this time for me and alleviate last years struggle was this: The Church does not act like it does not know what is coming. This period of time – the Nativity Fast – is in anticipation of the coming event. Part of my struggle was that I felt we should be acting almost like we did not know what was coming. This was the dark time – the penitent time – the fasting time. But that idea fell short of just how glorious the Incarnation is. Fr. Tom’s teaching on this helped me not only understand the “Winter Pascha,” but also Pascha itself. We begin to talk about the resurrection during Lent. In the historic Church, we also begin to talk about the Nativity before it is celebrated. Then suddenly, as usual in this journey, the plain sense of these things became apparent. When we were expecting our children, during the time of my wife’s pregnancy, we anticipated their birth. We knew it was coming, and we knew about when. So we prepared. Part of that preparation was in ourselves. My wife tried to take care of herself and eat right. The Nativity of Christ is a great event – so we prepare ourselves for that spiritual event in the spiritual way prescribed by our Lord and in the Scriptures – by fasting. Fasting is part of our preparation. But in that preparation, which is surrounded by anticipation, we also, as we waited for our children, bought their cribs – bought baby clothes – decorated the nursery. I bought my daughter’s first toy when my wife was less than 20 weeks pregnant with her. We did not act like we did not know it was coming, nor did we wait until our children arrived to decorate the nursery. We did all of these things in anticipation and preparation for their arrival. Nor did we, though, do all of the celebrating of their birth before they arrived, then once they did show up, cease the celebrating. Once our children arrived – that was when it really became joyful. It was then that we pulled out the cigars and celebrated. And the time following their birth was the time we celebrated the most – our beautiful children are here with us. They have been born. Glorify God! So it is with Christmas. This time before the Nativity is a time of anticipation and preparation. We know what is coming, and we are looking forward to it. I joyfully decorated my house, because I know the upcoming event is one of the most joyful events there is. And we also struggle to fast and prepare ourselves spiritually for the coming of our Lord and for this great event. We look forward to the feast, but we know it has not yet arrived. Today, we fast…but then, we will feast. This year, I do not forget what it is I am looking forward to, and why I celebrate it with great conviction and joy. I do not try to forget what is coming – one of the greatest and most joyful events known to man – the Incarnation of our Lord Jesus Christ! Have a Blessed Nativity Season! Last night we did a Thanksgiving Vespers in church. There was a line during the service when our priest, Fr. Mark, thanked God for both the joys in our life and the sorrows. It is not common that we thank God for the sorrows or the struggles and challenges that we face. Yet, if we are truly thankful to God, we must be thankful for the whole. This is one of the things that has impressed me so much about Orthodoxy, the way in which it sees the whole of life, not just a slice or a segment. Of course, though, it is the fullness of the Faith. The same is true for Thanksgiving. As was said in Vespers, we must not only be thankful for the good. One might add, ‘for even the Gentiles do that.’ We must be thankful for the sorrows we have faced, we must be thankful for the challenges and the hard times. We must be thankful for ALL things, and then, in that way, we can express real and true Thanksgiving to God for all of our life – the whole of it, which is all, in reality, His gift to us.